Back in New York after attending a friend’s daughters’s wedding in Montreal. It was a bit like Mumbai: partly cloudy and light rains. We had a really enjoyable time. Earlier in the week I had met up with Michael Psaltis. 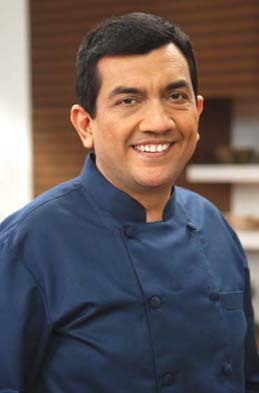 Michael has played an instrumental role in the making of my international recipe book How to Cook Indian, which is great hit in US, UK and Canada. It was lovely to see him again. Last night took friends out for dinner. It was at the Red Farm restaurant at Hudson Street and it is well known for the using farm fresh ingredients in innovative Chinese preparations. Though the décor is rustic, the chefs gave baskets of dimsums that carry a clean fresh approach. As planned, did have a get together for my college mates. It was great to see Saket Bimal again! He was in Mumbai early this month and we had a nice chat in my office. 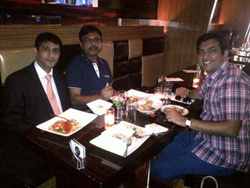 Meeting in NY again with Bhupesh Yadav, who came down to NY especially to see us. A bonus! We had a nice Thai lunch followed by a walk around Times Square. It is going to be a busy time with meetings and other work till we prepare to leave for Singapore on Saturday. Plan to spend at least a day there and then flying back home on the 26th. Flew down here last night after a short, two-day stopover with family in Singapore. Alyona and kids are enjoying in Singapore. I will spend this week in UK and Bath for the promotion of How to Cook Indian and then join them. May 23 – This morning meeting in Abrams & Chronicle Books office to streamline the whole week’s events. Then a late afternoon interview with Food Writers Guild. Rest of the day, probably catch up with my favourite places in London! May 24 – BBC Radio 4 Stations interview followed by a live telephonic interview for Talk Radio Europe, Spain. Then a late afternoon train ride to Bath where I have a cooking demo in Topping & Co. bookshop from 7.45 pm to 9 pm. Be back in London on Wednesday – May 25 – afternoon and meet up with sales and marketing team in London. May 26 – Thursday is packed. First, meeting with ‘Saturday Kitchen’ TV Show followed with a demo at the Selfridges Food Hall, Oxford Street. In this Selfridges Ocean Campaign, all the chefs are going to use only fish (approved by the Marine Conservation Society) and this event too has been created by Abrams and Chronicle Books. I have 40 minutes scheduled (1.50 pm to 2.30 pm) to demonstrate Mackerel Curry. May 27 – Radio interview with BBC Asian Network and later an interview with Foodepedia.co.uk. May 29 – Sunday. 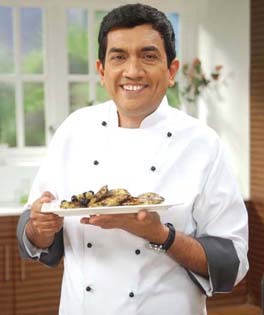 Event is at Hampton Court Foodies Festival in Surrey and my demo recipe is Kerala Fish Moilee. Fish, to think of it, is being chosen for the demos because it is quick to cook and healthy. How about some recipes for you then? Another Monday with a FoodFood meeting in office! The channel is really keeping me busy with various activities, I must say. And before I leave for my trip to UK to promote the new book How to Cook Indian I have to complete important things, both related to the channel and others. The office renovations are also still going on – I would not say that at a snail’s pace, but there’s definitely a scope to pace up! As for the weekend, it was quite a relaxing one! Worked through a greater part of the Saturday in office, and then a sumptuous lunch at Goa Portuguese Restaurant with Alyona. Evening time was movie time at home – trust me it was really great watching a good movie after a long long time! Then again, it was a lazy Sunday at home. Made dosas for breakfast and a chicken with vegetables pulao for dinner. And in between slipped in yet another movie! Hoping that Alyona and kids can join me for some time in UK as the kids are on vacation. As the event calendar for the book promotion is finalized I will be updating you with all the events planned in London and Bath. I will be in UK for a week beginning next Monday. As for this week, how about relishing mangoes in different avatars? 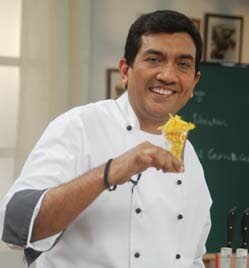 Now getting ready for the Sanjeev Kapoor’s Kitchen shooting that will go on for more than a week. My choices are simple and if at all the recipe reads a little complex, when you see it on the programme, it will look simple! Feeling jet lagged but happy that I just about made it back home before my birthday ended on April 10. Arrived home late last night and it is wonderful to be back with family. My sister in law, Vandana is here with family from Australia and there is more reason to celebrate a birthday…. My US-Canada trip was a really productive one. I will gradually share the pics but right now have some links which give you an idea of the media coverage in Canada and US. I have come back feeling very elated that Indian food is loved so much in the West and that people find it so intriguing and so interesting…I really think we should not take our lovely food for granted and continue cooking at home with great love and care. People abroad actually struggle to get the right ingredients so that their Indian food comes out perfectly! This evening will be attending the Varli Food Festival. This will be one of the final events before I start out for home. It has been a pleasant and exploratory experience for me – all these days I have been on the move and extremely motivated by the love, people have for Indian food and how intrigued they are with the recipes….my book How to Cook Indian has hit the right spot! Sending some pictures of the enjoyable evening at Indique Heights with Chef KN Vinod being the most gracious host. I had a very nice time with recipes from the book being presented by Indique Heights chefs, Abraham Varghese and Sivaraman Balamurugan. Chef Vinod made the food more delectable by passing around his inhouse specialties of Tamarind Margarita and Hot Passion. He also used this opportunity to introduce some elegant Nasik wines from India. The restaurant had a lot of enthusiastic guests who not only relished the food but also loved some photo ops with me! 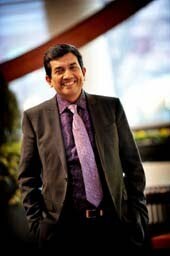 Most people don’t know that Chef Vinod is not only my friend but has also been my boss some 25 years ago! I had just got out of catering school in Delhi and came to the Ashok Hotel group. We cooked for thousands of people, for weddings and conferences. He was amazing, intelligent and caring – at a time when chefs weren’t sharing information with each other, he did so. 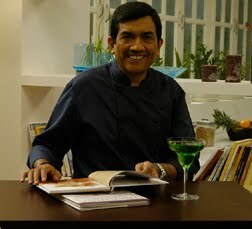 Chef Vinod introduced me to food writer and cookbook author Monica Bhide about five years ago. She was quite helpful in advising us about what would and wouldn’t work in US with regard to ingredients and all. I told her I didn’t want to tone down the Indian-ness of these recipes. The result is a book that is progressive, yet authentic. Take for example, a recipe called Tender Coconut and Cashew Curry. This recipes calls for tender green cashews as well as tender green coconut. Now, both these are not readily available in the States. So, I made a Kolambi Cashew Curry. This particular recipe is substantially different from its original incarnation. But I couldn’t do this book and not include this dish! So, I got the suggestion that I use shrimps instead of coconut. To approximate the texture of Indian cashews that are soft and almost creamy, we used soaked raw cashews in very warm water, then drained them. I cooked this dish for Bonnie S Benwick of Washington DC in the kitchens of Indique Heights over a short Q and A session. Book Signing at Indique Hieghts. Had an active last week! But first and foremost, missed being home to watch the World Cup victory euphoria! It sure warms the cockles of my heart to bask in the glory that cricket has been bringing to India. Another thing that is beautiful for me is my passion for Indian food! And to promote it big time, here I am, on a tour to US and Canada. Last Thursday I spent in Philadelphia with the morning being booked for the The 10! Show NBC Philly. I even did recipe demos of Lamb Pulao, Makai Palak and Majjika, three recipes from the book How to Cook Indian. Had tremendous back kitchen support. Early afternoon did an interview with WHYY-NPR and then attended an event at Barnes & Noble Booksellers. Back on the Amtrak around 10ish for a trip to Washington DC. 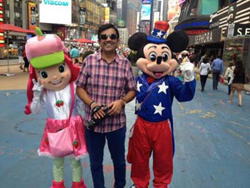 Friday, April 1 began with a taping at Darshan America in Washington DC. Afternoon went as relaxed and then an interactive and quite lively dinner at Indique Heights which was hosted specially to promote How to Cook Indian. The following day went in reaching Chicago for an evening event at Gaylord Restaurant. Sunday, took a flight to Toronto and settled down because early morning, i.e., on Monday 4th, had a live demo for the national cooking segment at Canada AM. We made Butter Chicken from the book. It was quite a rush but made it for the 10 o’clock Toronto Star Interview where I did demos of Masaledar Chholay and Punjabi Rajma. This was followed by a quick short Q and A session with the local papers and by 2, was off for the book signing at Costco Canada. Late evening, was back on the plane headed for New York. 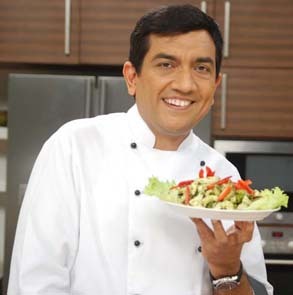 Today, have a media meet lined up plus a dinner at Tulsi Restaurant hosted by Chef and co-owner Chef Hemant Mathur. What’s on the menu? Sharing some similar recipes here!